It’s coming up to christmas I wanted share this delicious recipe so you can create it for your friends and family! 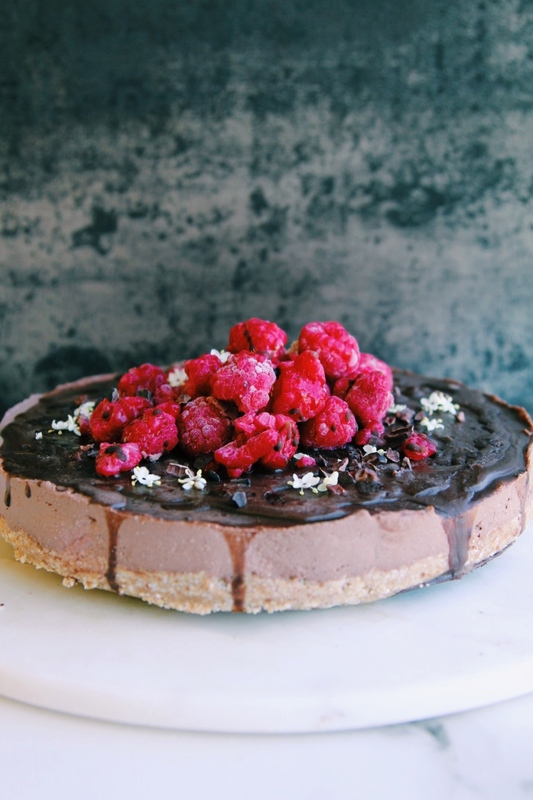 I know I’ve posted a chocolate and raspberry cheesecake before (because these flavours taste amazing together) however this one is very different because I have used tofu for the mousse filling instead of cashews which is perfect for anyone with nut allergies. Don’t be alarmed by the tofu, I’ve had people try it and they didn’t notice hehe! I’ve had some great feedback from this recipe and I know you will love it. Using tofu instead of cashews means its very inexpensive to make! 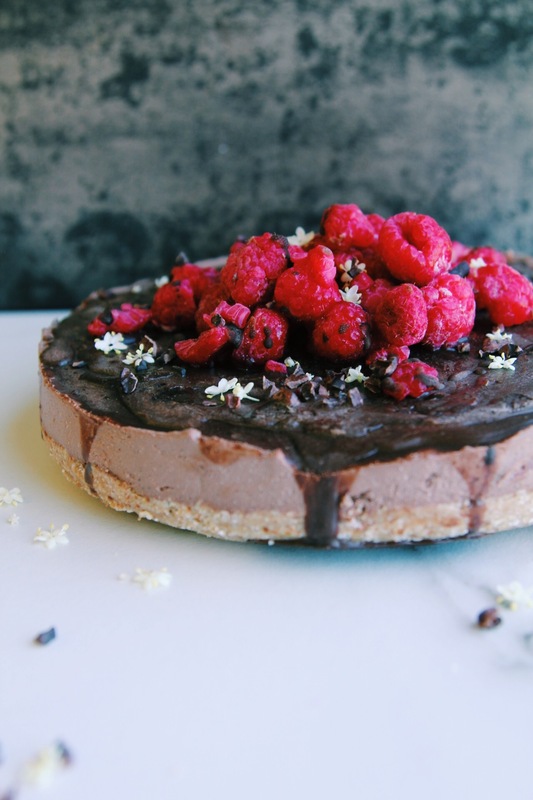 Tofu is very high in protein and low in fat and because of the protein content, you only need a small amount of this cake as it’s very filling. 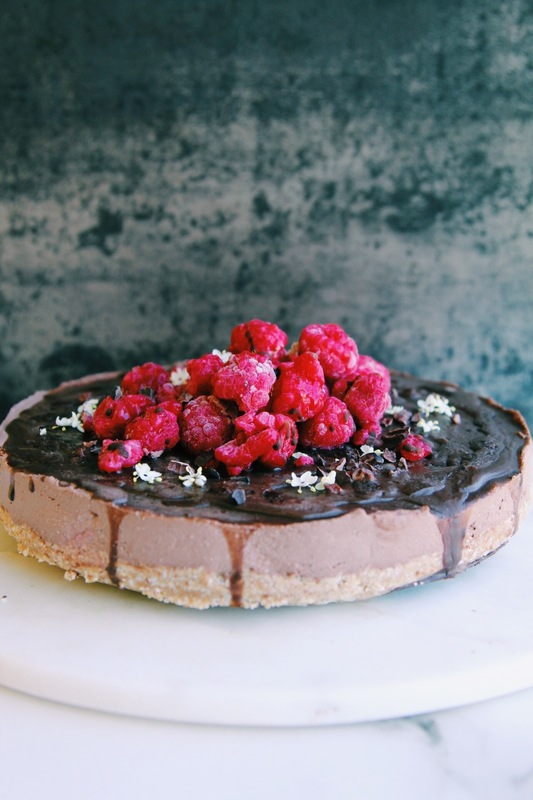 The raspberries provide a fresh delicious flavour to this rich cake and are also rich in antioxidants, vitamins, minerals and fibre. Start by placing the chocolate for the filling in a bowl and melt by place bowl in saucepan with water on a low heat or in microwave. While this is melting you can start making the rest of the cake. Add all crust ingredients into a high speed blender or food processor and blend until combined (it will be a bit crumbly like a biscuit). Line the bottom of a spring-form cake tin (I used a 22cm tin) with baking paper and transfer the base into the tin. Press down with fingers until its even and place in freezer. 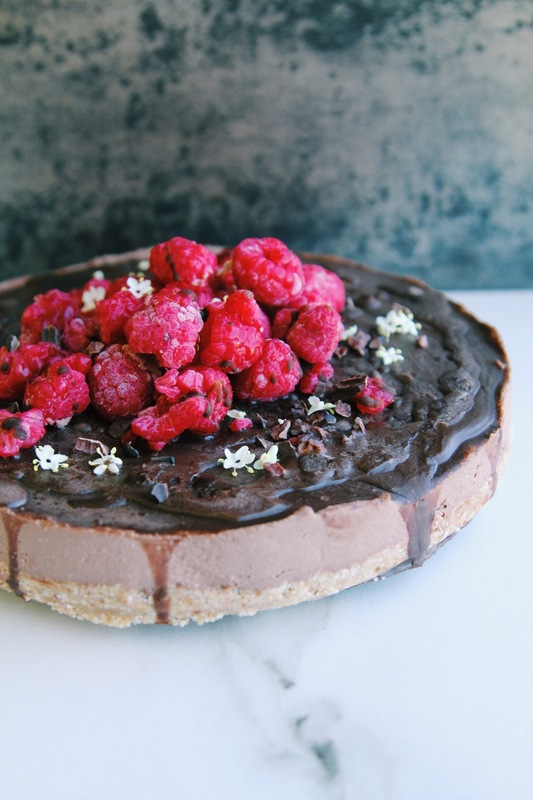 Place all filling ingredients into blender (except raspberries) and pour in the melted chocolate, blend until smooth and creamy. Add in the raspberries and stir into the mixture with a spoon. Pour onto the crust and even out with the back of a spoon. Place in fridge to set for at least 4 hours (overnight for the best result) and it will become firm. When you're ready to serve, using a butter knife carefully go around the edges separating the mousse from the side of the tin and take out of the tin. Make the chocolate sauce by mixing all ingredients together in a bowl until it becomes smooth then pour over cake (you could also use melted chocolate if you didn't want to make this). 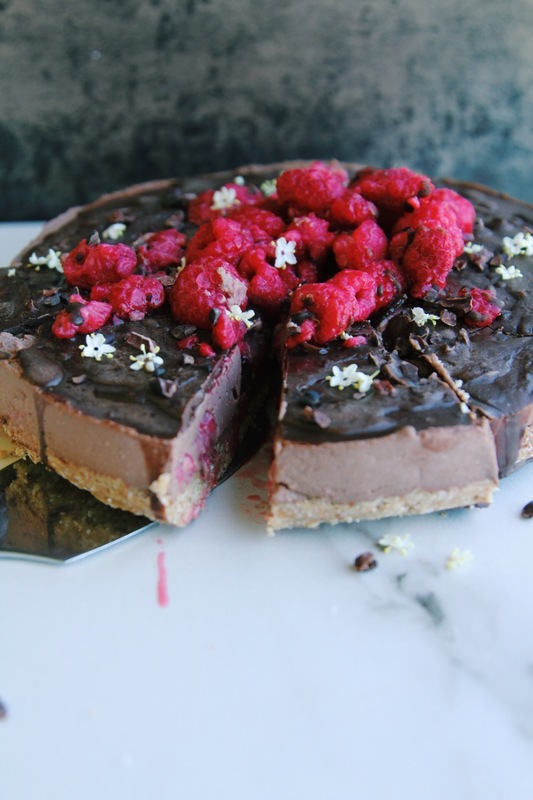 Top with fresh or frozen raspberries, cacao nibs and edible flowers for decoration! Store any left overs in fridge. This cake looks perfect! I love how clean the ingredients are and how beautiful the decorations are. Cashews can be very expensive, I agree! Cashew butter is already incredibly pricey–I can imagine the steepness of whole cashews! It does look like the tofu worked perfectly. I might even prefer it!